Aquarium Turbines | THERMO Spoken Here! is a "loss" of fluid energy mechanical energy. To shorten writing, we calculate the mass and enter its number. Next, entering and exiting temperatures and pressures of the water are the nearly the same, so (hin - hout) equals zero. The system is in thermal equilibrium so ΣQ = 0. Least power occurs when friction work is zero. So if my brother defeats friction, his "Aquarium Turbine" will return 0.021 watts to the power grid. 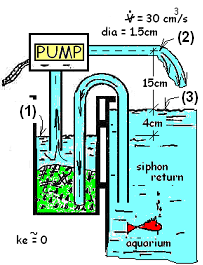 So what is the efficiency of our operating aquarium pump? If 0.021 watts can be gotten from the flow coming back, done right, 0.021 watts ought to enough power to get it there - with no friction. Our cheap pump eats 1.9 watts. Pump efficiency is "least work divided by actual work times 100," or [(0.021/1.9)x100] = 1.09%! Wow, are these lousy pumps or what?. There has got to be a market for my brother's Aquarium Turbine.